This is officially one of my favorite mythology series. 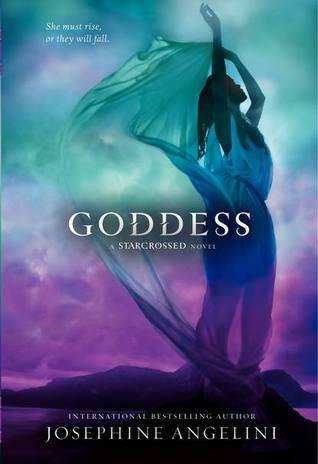 Goddess gave a very satisfying conclusion to the Starcrossed series. There wasn't much I did not enjoy. By now, if you've read any of these books, you are feeling pretty committed to the characters. Well, that does not change in Goddess. In fact, I felt more invested with this book than I did in the second one. I still flip flopped between being Team Orion and Team Lucas. I just couldn't decide. I love them both. I can say, though, that I felt pretty satisfied with the choice Helen had to make. But I was not overly happy about was the path some of the characters took. I am not a fan of killing off my favorites, no matter how they fit in the grand scheme of things. Something else that I noticed about Goddess that caught my attention from the start was the way the story was actually told. I was used to alternating points of view between Helen and Lucas, but this time around multiple characters were telling the story. That was really hard to pull off! I have to say though, the author did it wonderfully. Everything flowed and made sense. In fact, I think the story was stronger because of this unique set up. Of course, what would this series be if there were not twists and turns along the way? Goddess will not disappoint you in that department because it will keep you guessing. Even if you figure out some of the larger plot points, I promise that there are still enough unexpected surprises to keep it fresh. I am a HUGE Orion fan so I was not always thrilled with everything that happened in this book though I was resigned to the ending even when I think it was a mistake. I know what you mean. I really liked him too, but I'm glad he didn't end up alone.